I haven't done a baking blog post in absolutely ages which is quite surprising since I'm always baking at home, but today I'm back with an extremely scrumptious recipe that's easy to do and goes hand in hand with Easter - Creme Egg Cookies! 1. Firstly pre heat your oven too 180c or gas mark 5 and line a couple of baking sheets with greaseproof paper. 2. Then in a large mixing bowl, cream together your butter and caster sugar until it's pale and creamy, then pop in your egg and mix again. 3. Once all of your wet ingredients are well combined start adding the flour gradually, don't just throw it in all at once otherwise it will be so hard to mix together and your likely to get covered in flour in the process he he. 4. Then it's time to roughly chop up your Creme Eggs into different sized chunks, this is definitely easier to do if your Creme Eggs are at room temperature. 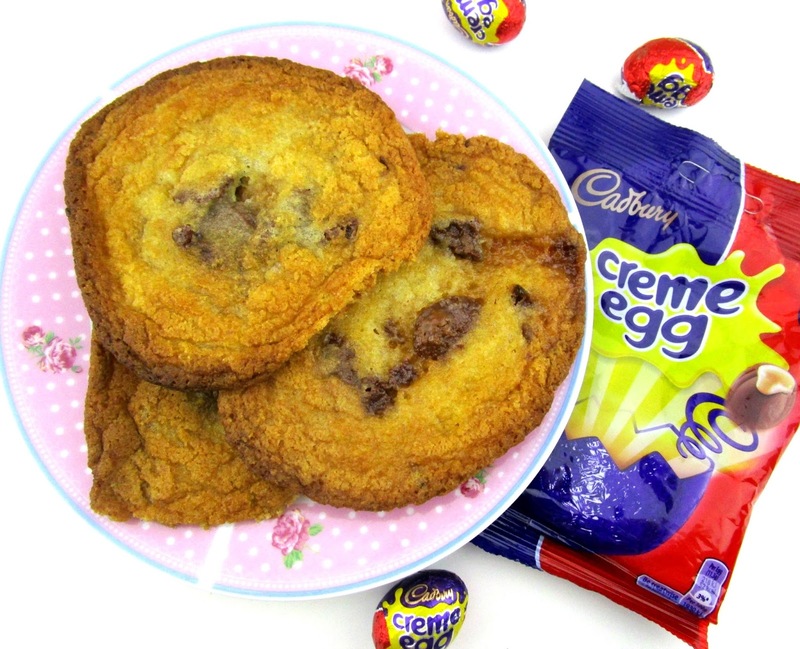 Once your happy with your chopped up Creme Egg's add them to your cookie dough and mix again until the Creme Eggs are well incorporated through the cookie dough. You can actually pop in more Creme Eggs than 5 if you like which is what I wish I would of done, the more you pop in the more yummyness you'll get running through your cookies. 5. Roll your dough into balls and place them on your baking trays spaced apart, I did space mine quite far apart but they still spread massive and ended up touching each other so just bare in mind that the bigger your dough balls are the bigger they will spread. 6. Pop them into the oven and bake for around 8-10 minutes. When you remove your cookies they will probably still look quite dough like but that's completely normal, as long as they are a nice golden colour they are done and will firm up as they cool. And there you have it, very easy but very yummy Creme Egg cookies! 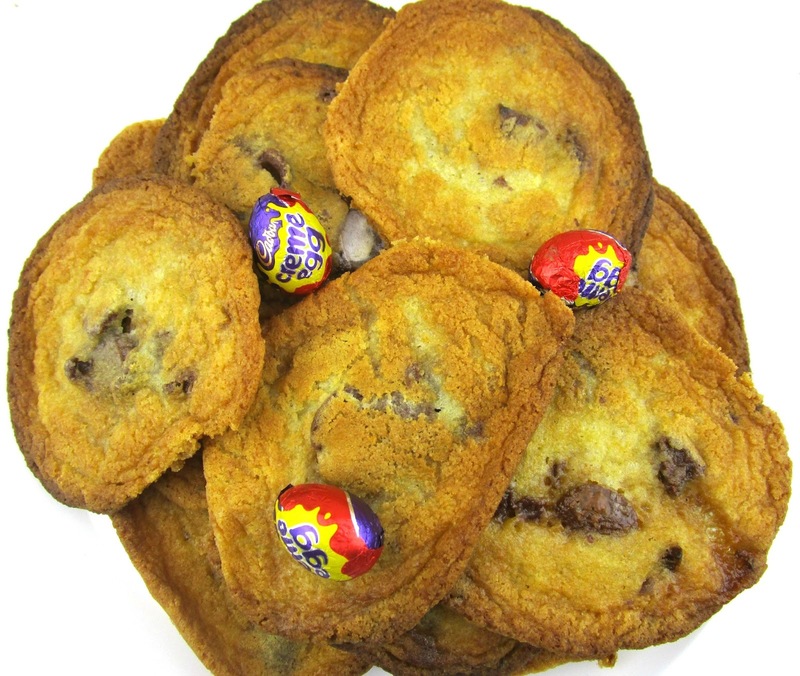 These are so nice because not only do you get the chunks of dairy milk running through the cookies but the goo from the inside of the Creme Eggs ends up melting and spreading through the cookies giving you a slight chewy caramel consistency that actually tastes of Creme Egg, it's amazing! 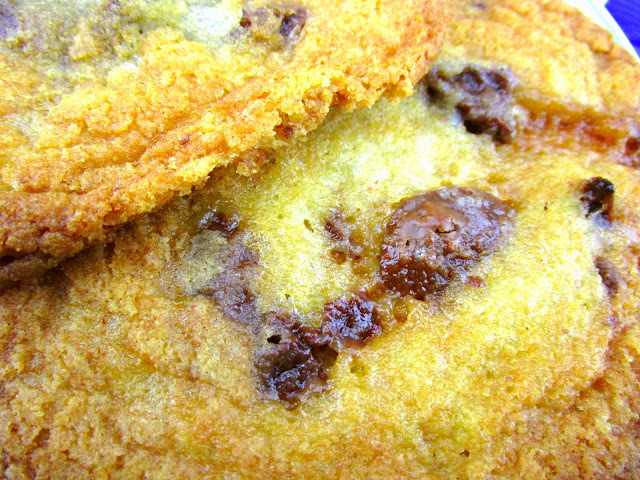 Do let me know what you'll be baking over Easter beaut's and if you give these yummy cookies a whirl, I'd love to know! I need to try this recipe, looks so good!